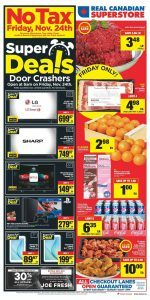 Real Canadian Superstore Flyer Super Deals 28 Nov 2017 provides super deal for your home. Not only home entertainment but also, food deals are rock! LG, SHARP and Samsung deals look amazing. If you need a new smart LED TV, Real Canadian Superstore is an amazing choice like always. For super deals, doors open at 6 am every day! Check out the newest Real Canadian Superstore Flyer Super Deals 28 Nov 2017 now and get more information about deals. Also, you can get 30% OFF at all apparel. Wait for extra clearance! For only Friday, some products on sale. Let’s check out all! Did you try bacon salad before? Yup. For a different taste you can discover this newest recipe. On the internet, there are a lot of recipes online. Find your favorite one and prepare for the good price. Meat varieties and vegetables on sale for good price at Real Canadian Superstore flyer. Join the Superstore club and get no tax! Only at Superstore. Limitless deals available at electronics. LG SHARP SONY HP EPSON on sale for every sector.